A little less than 2 weeks before we enter 2015. I want to thank all the Active Trend Trading and Early Warning Alert members for helping us launch and refine both service in 2014. We will continue to refine the outstanding training provided every week in the Mid-Week Market Sanity Check and how alerts and trade management updates are broadcast! A separate email will be provided that highlights our planned improvements and training syllabus for 2015! General Market Observation: The first thing to remember as we move into Christmas week is that Wednesday will be a shortened trading day. Friday will be a full day. There is a tendency for the Indexes to demonstrate an upward bias during holidays and with the momentum gained last week this may continue through the next two weeks. With the market’s still in correction if a follow through day takes place over the next 2 weeks it may not be as meaningful as a follow through in a non-holiday environment. SPX: On Friday the S&P finished at a resistance zone after an impressive move after Wednesday’s Fed meeting. The indicators are lagging price action and thus showing negative divergence. Given the holiday environment this factor may not be of any consequences and the Index may push higher and set new highs. In the last 10 trading days the Indexes has corrected and completed a roundtrip rebound erasing the 5% loss from the correction. If this does prove to be a too fast too much scenario we may get a pull back to a level of lateral support or the 20 or 8 day moving averages. At this point if trading Index ETFs this would be the zone to plan an entry or a breakout above 2079.50. NDX: As with the SPX the longer term uptrend remains intact but not quite as powerful as the S&P. Resting right on the 20 day SMA, this could serve as either trigger for a trade in either direction depending on what type of momentum comes in next week. I’ll be watching the daily and hourly intraday chart for potential trades in the Index ETF’s either QQQ or TQQQ. RUT: The Russell reacted very well with the promise of continued low interest rates. Price rebounded past resistance at the highs of September and looks to have a bead on the highs of the year. I’ll be looking for a pull back to around 1180-1183 for a potential long entry if the 8 0r 20 day moving averages catch up with price action. Outs & Ins: CALM makes its debut on the IBD 50 this weekend. This brings the total of stocks on the Running List up to 217 for the year. On January 1st we’ll reset the Running List to include only the first 50 stocks from the first IBD 50 of the year. Over New Year’s I will do the assessment of the original IBD 50 from 2014 and add this to the standing research covering the IBD 50 & IBD 100 since 2007. As usual the stocks moving back on the IBD 50 list this week are not ready for action with the exception of SNCR. SNCR is basing and may be moving towards an 8-20 moving bullish cross. 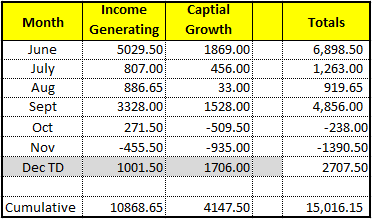 In addition it may be worthwhile to watch these additional stocks: CMPR, NOAH, BIDU, ALK & ABC. Off the Wall: “Success is nothing but a few DISCIPLINES, practiced every day!” What a great quote from Jim Rohn the late inspirational speaker. Jim was renowned for quotes that all seemed so simple yet so deep. Over the next few weeks we will take a look at some of these and apply them to trading. Today’s quote is so appropriate for trading regardless what level a trader is currently at. Failure to follow a few simple disciplines every day leads to a trader undisciplined with a tendency towards impulsive trading. Our challenge as traders is to find the “Right” Disciplines! That’s what we want to do with the Active Trend Trading System. Clarify and Simplify down to the basics of the system and then practice those every day. It is a very simple concept that is often challenging to apply because of “Discipline.” Remember—just a few disciplines practiced every day!